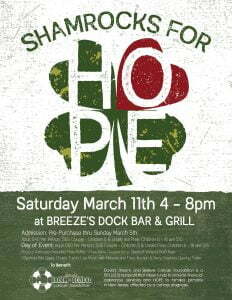 So excited to announce a new event just added to our 2017 calendar called Shamrocks for Hope. The Directors of Patient Advocacy wanted to create and manage a new event in order to “Pay Forward” the kindness, generosity of spirit and HOPE to current patients that was offered to them through David’s Dream & Believe Cancer Foundation. 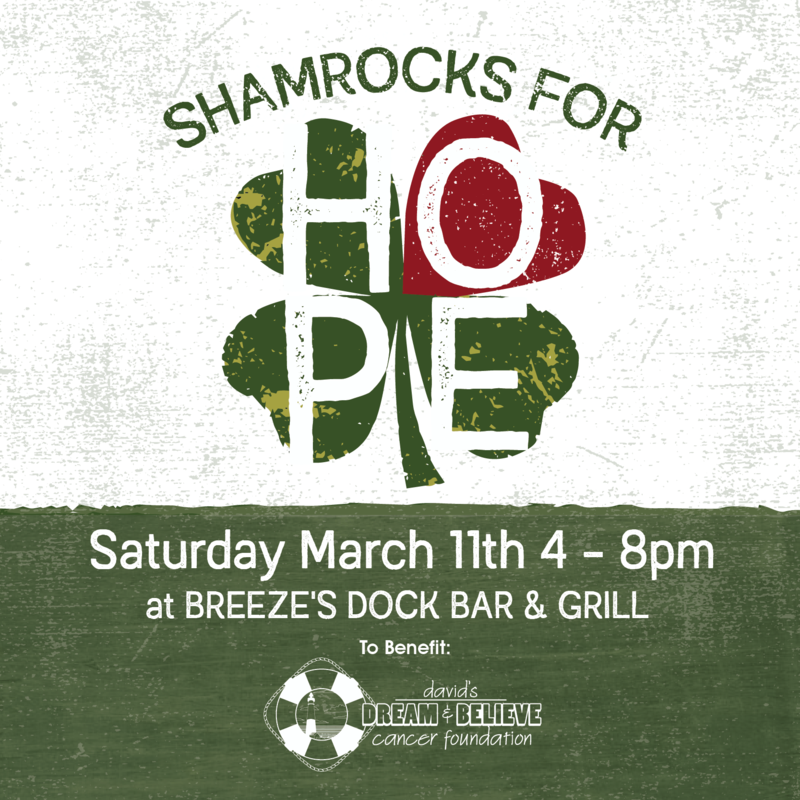 This event will take place on Saturday March 11th at Breeze’s Dock Bar and Grill, in the Viking Yachting Center, in New Gretna, from 4-8pm. The event is family friendly! A ticket will include: free buffet, 1 complimentary drink (wine or beer), 1 sponsor pint glass, 1 event t-shirt and Live Music by duo Melanie and Tony. Auction and Party Crashers Gaming Trailer! All proceeds from ticket sales and auctions will go directly to David’s Dream and Believe Cancer Foundation. This event is very special to me. Breezes is where I work, and where I met David for the first time. In 2015, I was diagnosed with stage 3 colon cancer, while I was pregnant. My family and I were struggling emotionally and financially from the diagnosis. 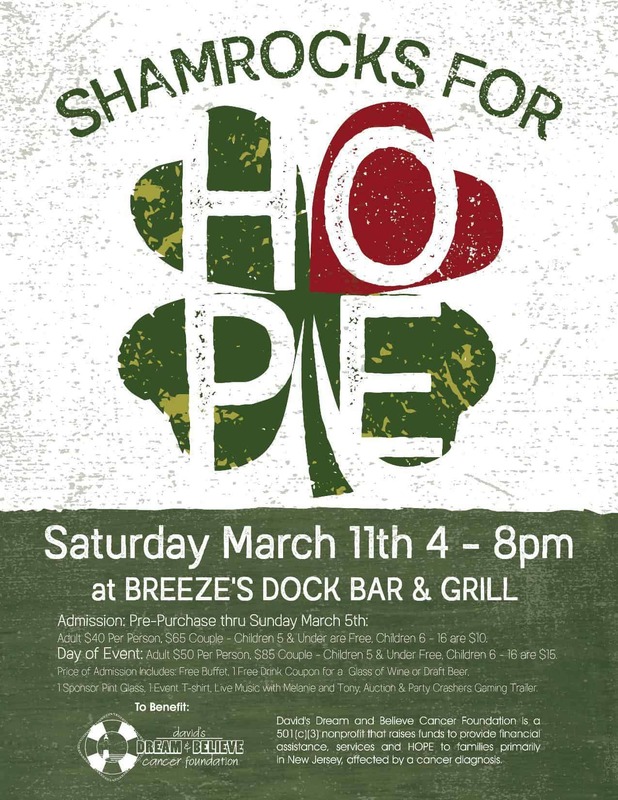 My friends and family held a benefit for me at Breezes. David attended that day and offered the foundation’s assistance to us. We had never met before, but he heard my story and wanted to help. It was at this moment that I knew, when I was able, I wanted to help others who were going through what I was. David was such an inspiration to me. I am honored to work with DDBCF now and help put together an event that can raise money to bring support and hope to families battling cancer.